Let the festivities begin with this bright and exciting August Steiner women's watch. The multifunction dial displays the day, date and dual time. This timepiece features sizzling crystals on the bezel and genuine diamond markers on the dial. 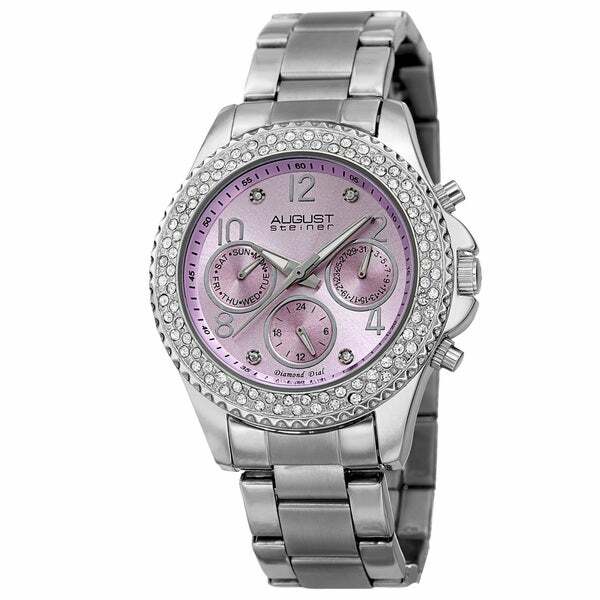 Ordered this watch because I wanted one with a purple dial. Dial is more pink than purple and the watch is really big and heavy. I sent it back for a smaller size watch. Love the watch but the face is more pink than purple. Arrived quickly and well packaged. The spring pin came out and I could not find a replacement. Otherwise, I did like the watch. The beauty and quality of the watch will be the perfect gift for Christmas.